Back in 2014, I had the opportunity to host Jürgen and his team when they came through Flow House in Silicon Valley. One day Jürgen came with his team and occupied half of the house, we all got a chance to hang out and enjoyed a few beers in the back patio on a couple occasions — they were quite a fun and hilarious group! But I also found they were up to something big. They’re a part of a big push to make Europe more innovative in the new economy. I wanted to take this opportunity to write about it. Creating a tech startup in Europe vs Silicon Valley has genuine differences that many entrepreneurs are already aware of. European investors and corporations generally value stability and (for the most part) the goals are more towards steady, sustainable revenues and profits rather than exponential growth. It’s not like profitability doesn’t make sense, especially when one views economics with a more traditional perspective — most companies do, including most large corporations in the U.S. But when it comes to creating disruptive technologies that change large markets, creating new markets, or creating startups that require lots of research and development or user adoption up front before profitability; Silicon Valley is usually the first place that comes to mind for the technology entrepreneur who wishes to achieve such a venture. So who the hell is Jürgen Furian & Andreas Tschas? Well, Jürgen and Andreas started an organization called Pioneers, which plays a part in the push to change these traditional perspectives of Europe. 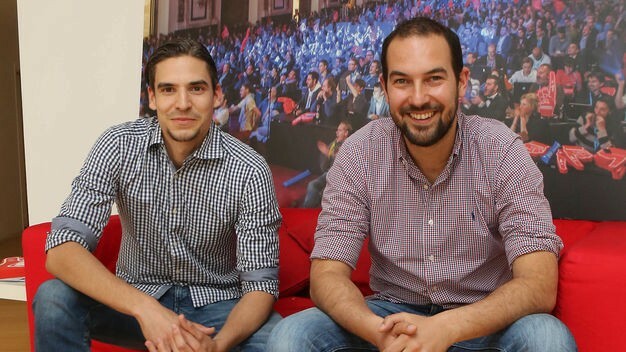 Their aim is to transform Europe’s traditional business culture into one that encourages startups and innovation. They’ve started this by spawning a huge annual flagship event in Vienna, Austria. Large corporations have roots planted all over Europe and have become successful in the historical economy of the last century. Corporations have become successful because they have mastered the old economy, but the new economy of today is changing rapidly. As of 2010, 85% of all products in the market were younger than 2 years old as compared to 1980, when 70% of all products in the market were older than 10 years. This is a remarkable trend and means large corporations of today need to shift and innovate, or risk falling behind. Corporations may have the capital and the resources, but often lack the agility, experimental culture and the tech expertise of startups and outside experts that are essential for innovation success. Pioneers events provide a platform that establishes and facilitates relationships between startups, corporations and investors to foster innovation. Since 2012, Pioneers offers startup intelligence to corporations and empowers startups to fulfill their potential. They serve to connect the corporate and startup worlds together, providing a bridge for corporations into the new economy and making innovation a reality for startups, especially in Europe. 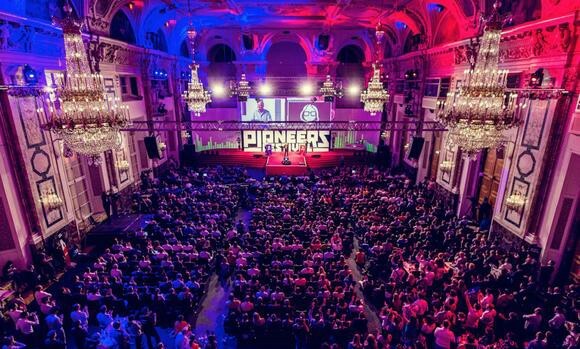 The flagship event (formerly known as Pioneers Festival) happens once a year in Vienna and has become the leading event in Europe for future science & technology ventures. The latest technologies are discussed including everything from Aerospace, IOT, Artificial Intelligence to Blockchain, Wearables, and DNA laser printing. At their sixth event in the year of 2017 Jürgen and Andreas have accumulated over 3000 participants, including 1000 founders and over 400 investors from 80 different countries. This event is held at Vienna’s iconic 500 year old venue, the Hofburg Imperial Palace — a palace once occupied by the kings, queens and political decision makers since the 13th century. So how did they start such a huge event in a historical building of Vienna, Austria? They needed to acquire the right partners, and these partners needed to understand exactly what they were trying to do. One great partner is PwC, now working with Pioneers for a fourth straight year. In 2018 the collaboration will have an even greater scope focusing on connecting startups and corporations. Pioneers also has a terrific key media partner in the form of CNBC. Other major partners include Hungarian National Trading House, Vienna Business Agency, Italian Trade Agency, Intel Corporation, Salesforce, IBM, Wirecard, InvestHK, Google and many more. The Office of the Austrian Chancellor has also lent its support to GovTech.Pioneers, while Magna is returning to partner Mobility.Pioneers for a second year running. These corporate partners want to connect with startups. They are a diverse group with one thing in common — they are all huge believers that with technology and entrepreneurship we can tackle the biggest challenges that we face in our future. Pioneers do much more than events. The bigger picture is to uplift startups around the world and within their respective local communities and regions, while also connecting corporates with the best startups for innovative collaborations. That’s why Pioneers has grown to include both consultancy and investment arms, advancing the growth of pre-seed and seed startups. It currently has almost 30 companies in its steady growing portfolio. Every region has its own unique set of problems. Some countries are more developed than others. Situations in education, health, water, transportation, food supply and housing issues are all unique throughout the world. The key is to connect locally with these other regions, plug into the diverse set of real problems they’re dealing with, find the next generation of startups and enable large-scale solutions. Connection. The problems we face together as a population on this single globe is real and the future can go either way. Major change is taking place and things are happening faster than ever before. Our companies and corporations have become successful in the old economy, and that is how they got here today. But if corporations move forward with their old ways and don’t connect with what is going on in the new economy — the real economy, the reality of today — they will sink. Increasing populations, human jobs displaced by automation, pollution, air quality, water supply, health care, education… we face all of these challenges together. What is it that will save us all? Well, Jürgen, Andreas and many others are betting on science, technology and entrepreneurship; and they’ve become a major part of the push to get Europe further involved. It’s inspiring. The reason why I wanted to write about this is because I wanted to share this with all of my entrepreneur and investor friends as well as the Flow House family — be sure to check out Pioneers and see how you can get connected. After being part of starting such a huge movement over the past five years, Jürgen and Andreas are now passing on the torch to their partners and proceeding with their next endeavors. Jürgen, Andreas, we’re very happy to have had the chance to host you at Flow House. It’s been great hanging out with you in Silicon Valley and I definitely look forward meeting you in Vienna some day! Keep doing well my friends. Jason Weber is a Software Professional, Founder of Flow House™ and Founding Member of Flow Enterprises LLC. He’s worked for Amazon, HP and Intel Corporation with several issued patents in the digital product space. Writer/editor for The Silicon Valley Post. He’s into practical Zen, the Flow State, High-Tech & the Hustle.